One of the results of industrial revolution was the acceleration of the pace of colonisation. The North-South gap became a stark reality of evolution of political and economic world order. The world was divided into the privileged imperialistic and colonized blocks. Though the colonizers did focus on development of infrastructure in their colonies and introduced many political and social reforms but most of these were directed towards their own national interests and genuine economic development did not take place. Era of colonization is long over, and the post-cold war era is marked by the rising influence of forces of globalization. This era has seen the withering away of tense atmosphere created by the mega conflict of bipolar division of the world but has seen the surfacing of many regional conflicts. There has been an academic and political resurgence of conflict resolution activism. All games other than being a source of entertainment, have a significant role as a conflict resolution agency. National teams do compete each other and are chanted with highly charged nationalistic slogans, but it all ends up at the sports field, much better than settling scores at a battle field. A match is played in an environment where national anthems are sung, national colours are worn, national pride is highlighted, national songs are sung but the real focus is the game, the athletic excellence of players and sportsman spirit. In times when world is becoming antagonistic, sports fields are such a respite from political conflicts. A true manifestation of the binding power of sports has been the French team during the football world cup 2018. They are a multi-ethnic unit lead by their dedicated coach Didier Deschamps, the person who brought home their first world cup trophy as team captain. The team comprises of quite a few players from the former French colonies in Africa. The team that played in 1986 world cup was all-white and the squad that plays the 2018 final today is almost 70% “coloured”. This team includes players with origins from Congo, Cameroon, Guinea, Nigeria, Senegal, Mali, Angola, Morocco and Algeria. There is a mixed religious identity of the team members. All these differences become irrelevant when they are perceived as a team. They train, practice, dine, plan, play together. Their ethnic, cultural and racial diversity has been an interesting factor of the tournament. Their team shirts had a phrase written on them, “Nos differences nous unissent” (Our differences unite us). What a beautiful message and what a beautiful display of spirit it has been. Many of the players have been playing together with players of other nationalities in leagues and club teams, hence are good friends. Before their match with Uruguay team which included on and offfield friends, the French team brought them their traditional tea as a friendly gesture. After defeating the Belgian team, Mr. Deschamps was the first one to console their assistant coach who was his former team member. These are little gestures of sportsman spirit and congeniality, but they go a long way in creating a harmonious global environment. They are a true embodiment of French national motto, “Liberté, Egalité, Fraternité” (Liberty, Equality, Fraternity). This is an excellent example of how sports bring about incredible unity not only among the players but entire nations. A sincere leadership and spirit of unity makes all differences irrelevant. There was a brutal terrorist attack in Mastung in Balochistan province of Pakistan on Thursday. It is a callous act by enemies of peace and a magnanimous tragedy for the aggrieved families and the whole of Pakistan. It is heart wrenching to see how some people are trying to give it an ethnic and regional connotation. It is a crime committed against Pakistan’s stability and its people. Diversity is the beauty of a federation and all component religions, cultures, ethnicities are beautiful parts of a whole. Celebrating and mourning are to be shared. Former colonizers and subjects have moved far ahead of their unpleasant past and are seen contributing to development of their respective nation-states and playing together as team members. In spite of being the most diverse team, the French have displayed remarkable harmony amongst themselves and humane culture towards their competitive teams. 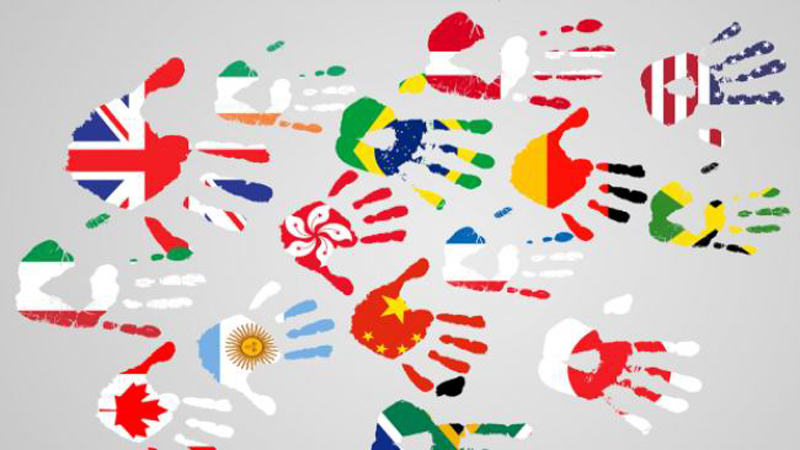 The world is moving, though sometimes too slowly, towards a cross cultural harmony and globalization. Instead of a “clash of civilizations”, the idea of bonding of civilizations is being popularised, at least on the playgrounds. The cold war barriers are eliminated to open the grounds of former USSR for the teams and supporters from the whole world. I wish we could carry forward the message of sports, particularly the one presented by the French squad, to our inter-personal, inter-regional and international interactions. French commemorate their great revolution of 1789 on 14th July every year which was an event that left a profound impact on evolution of principles of human rights and democracy. The world has learned a lot from the French political experience, it’s time to learn from their football team experience. There has to be a team like harmony amongst world leadership to combat enemies like poverty, hunger, environmental degradation, resource management and diseases. Ball needs to be passed on and right moves made beyond all differences of ethnicity, regionalism, skin colour, language and gender to reach the goal of development and civilization. 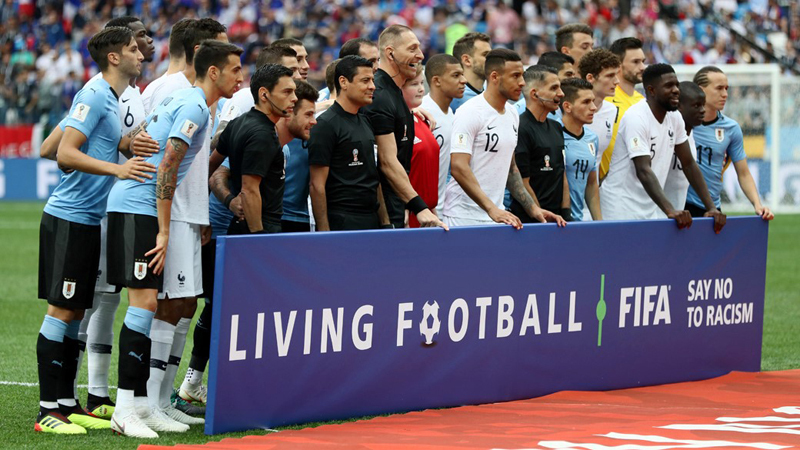 French team with official shirts displaying the message of unity beyond differences is perhaps the best one to reach the finals. Sports fields ought to be the only fields where nations compete and, in all matches, the winners are sportsman spirit and peace. Published in Daily Times, July 15th 2018.